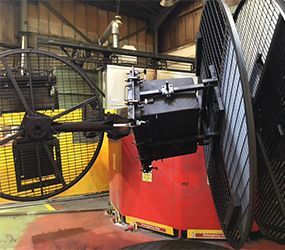 We take great pride in our manufacturing process here at Excelsior – but none of it would be possible without careful attention to the condition and performance of our machinery on the shop floor. We’ve recently spent quite a bit on refurbishment of some of our key pieces of equipment, which we think makes it a perfect moment to give you the inside scoop on exactly how we make your plastic products. If you’ve ever been fortunate enough to see a clam shell machine in action, you can’t help but agree that it’s pretty aptly named. For those of you who haven’t seen one before, it’s basically shaped exactly like a clam, with a large hood yawning open above the actual oven. Its operation is equally simple in principle; the tool goes in and the clam shell shuts over it. The product is cooked, the tool cools, and we take the product out of it. The entire process – or ‘cycle time’ takes around an hour. As you can imagine, this makes it somewhat tricky to complete massive product runs in short spaces of time – instead, the clam shell machine is better suited to large products in small batches, rather than numerous smaller ones. That doesn’t mean that we don’t try and keep the roto-moulding process as efficient as we can at Excelsior. We place multiple products on a single arm – from different customers if necessary – for contract moulding, allowing us to cook several products at once. Not only does this keep our energy costs down, but makes our clam shell machines more economical to run; a saving we ultimately pass onto our customers! One of the few governing conditions of this is that all products going into the machine have to be the same product thicknesses – otherwise, we’ll end up with one product moulded to perfection while another has either been over or under-heated, making it effectively useless for its end use. Another major staple of our shop floor is our carousel machines. It’s a multi-arm machine that can support a greater amount of smaller tools when cooking. Usually at any one time we have, one arm cooling a batch of products, another arm cooking a fresh batch, while we keep the spare arm for de-moulding finished products. It’s this that makes the carousel machine equally as economical as the clam shell machine – if not more – and without the need for such in-depth careful management, either. As before, we do have to make sure that we’re cooking products that are compatible with each other, so that they’re all suitable for the range of temperatures and cooking times that we’re subjecting them to. The final roto moulding machine, our shuttle machine, is even more straightforward in operation; we place the tools in the oven, which moves left to right as it cooks the products evenly on all sides. It’s handy for space purposes, and though it’s not in quite as heavy demand as the other two machines, it’s still an invaluable addition to our workshop. At Excelsior, our customers are at the centre of everything we do. We ensure that we keep our machinery and tools in top condition, so that we can continue to uphold our commitment to you. We’ve got more than 40 years experience in the field of roto-moulding – you can read about our projects for previously happy customers on our case studies page. On the other hand, if you’ve got your idea for your plastic product all ready to go, don’t hesitate to get in touch with us on 0161 765 2010, or use our enquiry form to fill us in on the details.